An amazing thing happened that night in the little town of Bethlehem. Only a few understood. They were told in advance of the event in which they were chosen to play key roles. The few privileged to hear the announcement of the birth of a baby were aware that something unusual and marvelous had occurred, but what, they did not understand. There was one, a pitiful, paranoid, little old man who was told of the event perhaps as late as two years after it happened. Fearful of what it might mean for him, many innocent lives were brutally snuffed out at his command. Prior to that night in Bethlehem, God was known only to his chosen people, the Hebrews. He dwelt among them, at first in a tabernacle, and then in a temple built for him. The few who were allowed to approach him did so with fear and trembling as did Moses on Mt. Sinai. With the birth of Jesus, God himself entered history. The God of the Hebrews was henceforth accessible to all. Not only that. As he went among his people telling them that the promised Messiah had come, he ministered healing to the physical and spiritual needs of those in need. Since the death and Resurrection of Jesus Christ, Christians have followed his example. The Gospel is proclaimed throughout the world, and those suffering, whether followers of Jesus Christ or not, receive a cup of cold water in the Messiah’s name. It is through human hands that Jesus touches those in need. 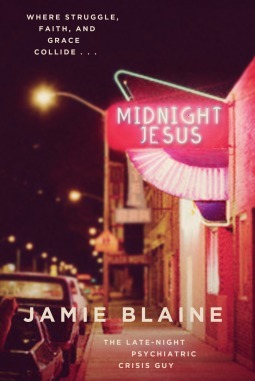 This is the theme of Jamie Blaine’s new book, Midnight Jesus: Where Struggle, Faith, and Grace Collide (Nashville, TN: W. Publishing Group, 2015). It is a collection of vignettes that illustrate how the Lord reaches into a suffering world through the life of one who works in a psychiatric ward, answers a crisis hotline, and yes, even as a assistant manager of a roller rink. “Jesus said whatever you do for the least of my brothers and sisters, you do for me. So when I go see the guy in jail who is crying and kicking the wall, I think, There’s Jesus. And if he’s eating screws and he curses and throws his shoes at me, well, maybe it’s more like, Okay, that’s Jesus’ little brother. Still. Better be patient. Be kind. Minutes pass as Blaine and the derelict wait for the van. Blaine probes him about how many drinks he has drunk during the day. “Just one,” he answers, then continues his sermon. After the hospital van picks the man up and drives off, Blaine is left reflecting on how truth is found in strange places. Jesus continues his earthly ministry as his Holy Spirit embodies and empowers his followers who are his body. But, as is seen in the Bible, he also uses “perverts and murderers, prisoners and women of ill repute,” the weak and foolish. This is a book that needs to be read. F. Scott Fitzgerald was a key figure in the history of the Roaring Twenties. It was Fitzgerald, or “Scott,” as he was known to by his friends, who coined the term “Jazz Age” to describe the period. His best known novel, The Great Gatsby, first published in 1925, is a must read for anyone interested in America during the 1920s. I have read The Great Gatsby several times and seen both the 1972 film version starring Robert Redford as Gatsby and the 2013 film version starring Leonardo DiCaprio. The former is a classic that never disappoints, no matter how often viewed. The latter is a paltry attempt to update a classic. One would think that after many attempts Hollywood would learn that a remake seldom meets, much less exceeds the standard set by the original. I am reading a number of books on the Roaring Twenties in preparation for an upper level American history class I will teach during the spring semester. In order to get a “feel” for the era, I spent hours watching videos and listening to music from the twenties available on YouTube. I decided to read some of the classic literature of the period, including a 1951 reprint of the original 1920 edition of F. Scott Fitzgerald’s This Side of Paradise. This Side of Paradise is Fitzgerald’s first novel. It is a coming-of-age story based on his early life. He began writing it in 1917 shortly after accepting a commission as a second lieutenant in the army. Joining the army was a ruse to divert attention from the fact that he was flunking out of Princeton University. The finished manuscript, four chapters in length and titled “The Romantic Egotist,” was rejected by Charles Scribner’s Sons in 1918, but with the suggestion that he rewrite and resubmit it. Scott undertook a frantic rewriting of “The Romantic Egotist” in 1919. He was in love with a beautiful Southern belle, Zelda Sayre, member of a prominent Montgomery, Alabama family with deep roots in the Old South. He was sure he would soon be a rich and famous author; he only had to convince her. Only then could he win the hand of the fair Zelda. She was not the sort of girl likely to marry a man with great dreams only. On September 3, Scott fired off the typed manuscript to Max Perkins at Scribner’s and returned to his mundane job roofing freight cars at Northern Pacific Railroad. This Side of Paradise was published on March 26, 1920. The first printing of 3,000 copies sold out in just three days. Eleven additional printings followed during 1920 and 1921 for a total of just under 50,000 copies. It was a phenomenal success. Scott telegraphed Zelda to join him in New York. On April 3, 1920, barely a week after the publication of This Side of Paradise, Scott and Zelda were married in New York’s St. Patrick’s Cathedral, following which they set up housekeeping in an apartment on West 59th Street. Scott and Zelda Fitzgerald became the poster couple of the 1920s. The romantic image we have of the Roaring Twenties as an era when life was one never-ending party, a dizzying swirl of jazz, flappers, bootleg booze, and gangsters is a creation of F. Scott Fitzgerald. In his fiction and the lifestyle he and Zelda lived, he created and gave life to the theme of a “Lost Generation” searching hopelessly for meaning in an existential world created by the horrors of the Great War. The post-World War I era was a period of spiritual emptiness. Western Civilization was in its “golden age” during the decade and a half before an assassin’s bullet struck down the heir to the Austrian throne on June 28, 1914 in the picturesque Serbian town of Sarajevo. In the four years that followed, the glamorous fairytale world portrayed in the popular BBC television soap opera, Downton Abbey, was shattered by images of a troglodyte world of muddy, rat and lice infested trenches filled with frightened and hopeless young men waiting for the command to “go over the top” into the face of rapid-firing machine guns and near certain death. Those who survived the “war to end all wars” could not forget the stench of rotting bodies scattered about “no man’s land,” some hanging silently on rolls of barbed wire, a smorgasbord for overweight rats. They couldn’t rationalize it. They couldn’t believe, as did many, that it was possible to go “back to normalcy,” that is, “Ye Good ol’ Days.” They knew that what was lost could never be restored. Unlike Scarlett O’Hara in that closing scene from the movie, Gone with the Wind, they knew there was no going back to Tara Plantation. They sensed that at least for them, there was no future. Can one find anywhere in the literature of the 1920s a better description of the lost generation than these closing lines from This Side of Paradise? There was no God in his heart, he knew; his ideas were still in riot; there was ever the pain of memory; the regret for his lost youth – yet the waters of disillusion had left a deposit on his soul, responsibility and a love of life, the faint stirring of old ambitions and unrealized dreams. But—oh, Rosalind! Roaslind! . . .
“It’s all a poor substitute at best,” he said sadly. “He stretched out his arms to the crystalline, radiant sky. The ordinary American knew nothing of the new world inhabited by the so-called Lost Generation. They did not read the literary works of Fitzgerald, Dos Passos, Eliot, Hemingway, and a host of others that are covered in American literature classes today. Their names and the titles of their novels are known to a select group of educated person today, either because they have seen a movie based upon one of the novels, or, perhaps much less likely, actually read one or more. A cursory glance at the lists of bestselling novels in the United States during each year of the 1920s reveals that not one of the authors commonly included in a list of the lost generation is included. That’s right, not even F. Scott Fitzgerald. The popular authors of the twenties included Gene Stratton-Porter, Harold Bell Wright, and especially Zane Grey. Fitzgerald’s This Side of Paradise sold approximately fifty thousand copies in 1920, while Harold Bell Wright’s The Re-Creation of Brian Kent, also published in 1920, sold close to a million copies. Wright was the first American author to sell a million copies of a single novel, and the first to become a millionaire from writing fiction. Five of his novels each had sales equal to one percent of America’s population at the time. To illustrate further how different were the reading habits of the literate masses during the 1920s from those who read the works of the lost generation writers, I need only mention that the Tarzan novels by Edgar Rice Burroughs sold more copies than those of Stratton-Porter, Wright, and Grey combined. Burroughs’ Tarzan adventures and other bestselling fiction were not considered serious enough to be included in the Publishers Weekly’s list of bestselling novels. Was the decade of the 1920s really what is portrayed in the fiction written by Fitzgerald and his compatriots, or is the “jazz age” merely a bit of a self-appointed intellectual elite’s nostalgia for a mythical past no more connected to reality than the antebellum South found in Margaret Mitchell’s Gone with the Wind?